A big problem with SEFAUtil (and also the Powershell commands in Skype for Business) is that it usually takes 2-5 seconds to check the settings for each user, and another 2-5 seconds to change their setting via the command line. In addition to this, you can’t directly query a call pickup group number to see which users are in that particular group. Instead, you have to query each user individually to establish the call pickup groups of which they are a member. If you think about that, for 1000 users it could take you (1000 x 5 seconds) well over an hour just to discover which groups all the users are in. This seems a little excessive to me. Works with both Lync 2013 using SEFAUtil or with Skype for Business CU1+ using Powershell commands. 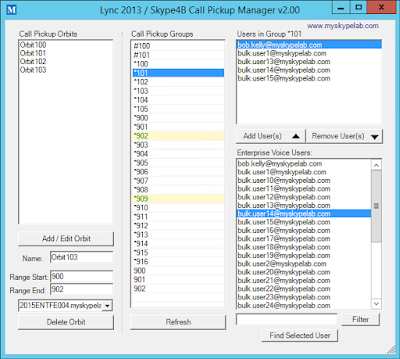 Call Pickup Group Manager discovers call pickup configuration information directly from the Lync / Skype for Business database. This avoids having to poll every user individually using SEFAUtil or Powershell to find their settings. 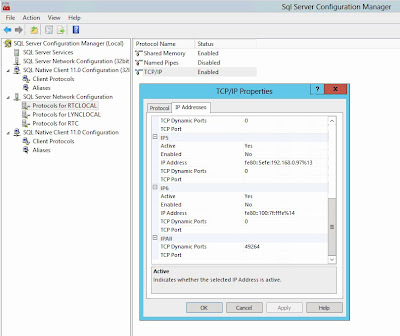 This makes configuration discovery much faster than SEFAUtil or Powershell can offer in Lync 2013 or Skype for Business. Easily Add, Edit or Delete Call Pickup Orbits. Group-centric configuration of groups. ie. You can look up groups and see which users are in them rather than looking up each user individually to find their group assignment. Use the "Find Selected User" button to find which group a user is assigned in. Use the Filter button to reduce the user list to quickly find the user you want to add. Now checks that Group number matches a range that exists in one of the Call Pickup Orbits before allowing it to be added to the group list. Up and Down keys in Orbit listbox now update orbit details properly. Now checks the Skype for Business RESKIT location. Put a dividing line between the Orbit creation section and the Group configuration section to try and indicate a divide between the two areas. The Group list box label now displays the group name being listed up so the user understands better what group the user list is associated with. When using Skype for Business the new Call Pickup Group Powershell commands (Available in Skype for Business CU1+) for user settings are detected and used instead of SEFAUTIL. 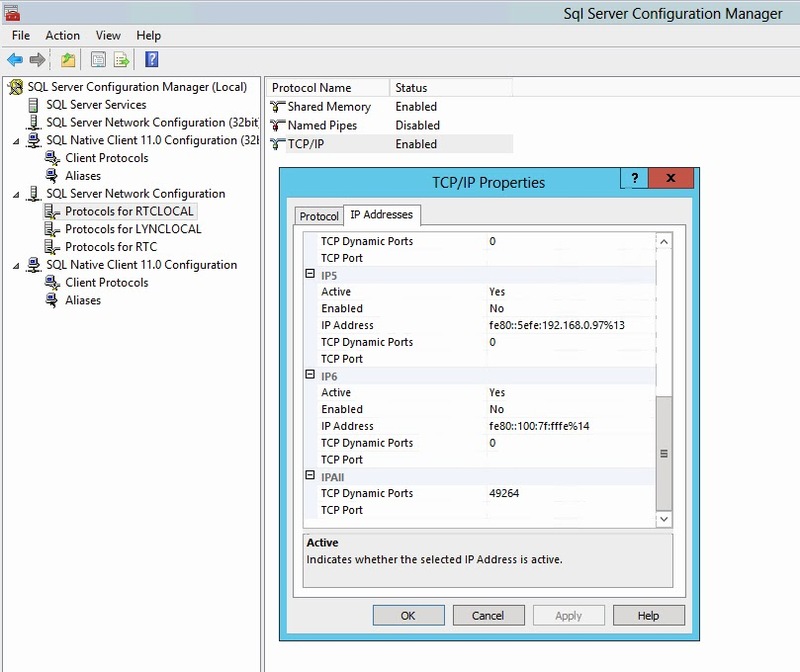 This means you don't have to worry about any SEFAUTIL configuration anymore in Skype for Business CU1 or higher! Unfortunately the Skype for Business Powershell commands have proved to be too slow for the discovery of all users Call Pickup Settings (because "Get-CsUser | Get-CsGroupPickupUserOrbit" has to iterate through all users taking about 2 seconds per user and takes ages). So I have retained and improved the direct SQL discovery method from version 1.0 for both Lync 2013 and Skype for Business. Changed the way the Groups list box works. It now will be automatically filled with all the available groups from the Orbit ranges assigned in the system. If there is a user in a Group then it will be highlighted in Green text with Yellow background to help you find users without looking in empty groups. When Orbits are added all the available groups will automatically be added to the available Groups list. Note: when you remove ranges that contain groups with users in them the group will no longer be accessible in the interface, however, the Pickup Group will still function. So make sure you remove users from groups before you delete the Orbit range. Added a refresh button so the data can now be updated from the system whenever you want. Improved the speed of looking through groups by re-architecting some of the code. Added pretty looking UP and DOWN arrow icons on add and remove buttons to try and clarify operation. Added the "Find Selected User" button to find which group a user is assigned to. Added help tool tips on buttons. Added an export to CSV data to the app. Fixed an issue with highlighting groups with users in them. Now supports Skype for Business 2019. There are some important prerequisites that you need to use on both Lync 2013 and Skype for Business for the Call Pickup Group Manager to work properly. Requires SEFAUtil installed on the system to Add, Remove, and Edit Call Pickup Settings. 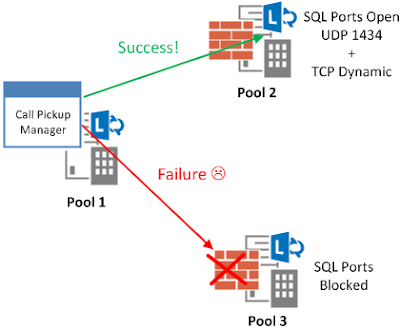 Requires SQL Dynamic Ports opened in Windows Firewall on all Front End servers. 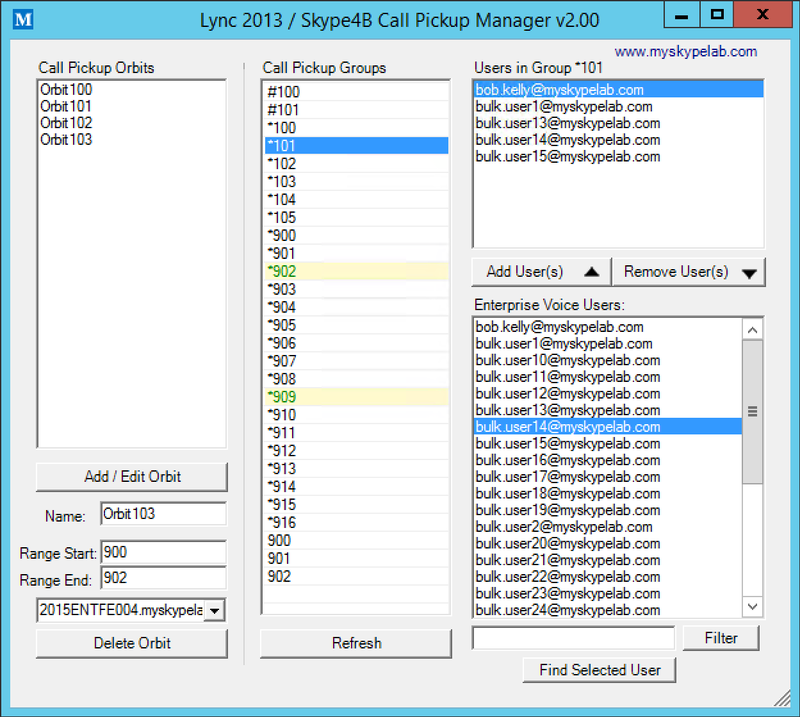 Under the hood, the Call Pickup Manager on Lync 2013 will use the SEFAUtil for adding and removing users from groups. This was a deliberate choice, as I wanted the tool to be supportable by Microsoft (ie. by avoiding any direct database editing, or hacking of things), and you don’t have to fear any unnecessary database corruption from using the tool. In order for the Call Pickup Manager to quickly download call pickup settings from your deployment, it needs access to your RTCLOCAL databases for each Front End pool. If you only have one Standard Edition server, then you can run the tool directly on this server and it will be able to access the RTCLOCAL database directly (note: this is also the case for an enterprise edition pool, but you need to run the tool on the first server in the Get-CsPool -> Computers property array, because this will be the database the tool tries to connect to). If you have multiple pools, the Call Pickup Manager will try and connect to each pool to download all the call pickup data for each pool (Branch SBA's also count as a separate pool). This is fantastic stuff. I hope you don't mind but I wrote an article on call pick-up as a how to and added references to this page. No worries Randy, glad you like the tool and felt it worthy to write about. Very useful tool. I used to use a script earlier, but to get the output on users and their group nos, it was taking 2 - 4 seconds per row. Saved a lot of time for me..
Just Awesome. Thank you very much!